The Prodigy's Keith Flint, best known for his vocals on "Firestarter" and "Breathe," died over the weekend. He was 49. Flint was found dead at home in Essex, England. No official cause of death has been revealed but The Prodigy's Liam Howlett wrote on the band's Instagram page that Flint died by suicide. "The news is true , I can’t believe I’m saying this but our brother Keith took his own life over the weekend," Howlett wrote. "I’m shell shocked , f—in angry , confused and heart broken ..... r.i.p brother Liam." “It is with deepest shock and sadness that we can confirm the death of our brother and best friend Keith Flint. A true pioneer, innovator and legend. He will be forever missed," the band wrote in a separate statement on Twitter. Police confirmed earlier that a 49-year-old man was found unresponsive at his house in Essex on Monday morning. His next of kin have reportedly been informed and the death is not being treated as suspicious, the police statement added. 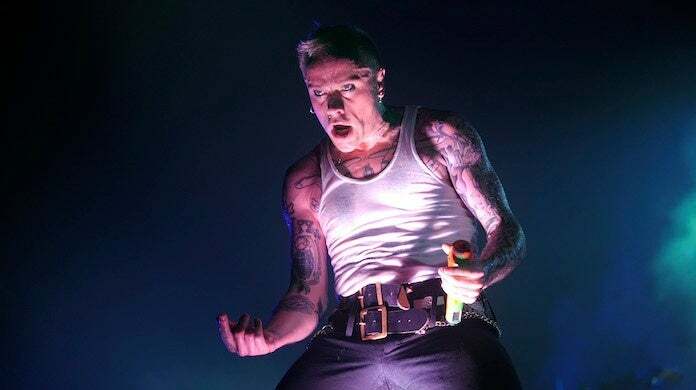 Flint's distinctive appearance — which included a colorful mohawk and tattoos — vocals and dancing made him an instantly recognizable figure on the British techno scene. He joined The Prodigy soon after it was formed by Howlett in 1990, first as a hype man and then by 1996 as the band's frontman. "Firestarter" became a global hit and UK No. 1 for three weeks that year, teeing up The Fat of the Land as one of the most successful UK dance albums of all time. "I loved his music and boom, I was in," Flint told FHM magazine. "I was never the brains behind the band - that was always Liam. But together we were a complete package. It was the outlet I was looking for," he said. When The Prodigy's next album, Always Outnumbered, Never Outgunned, was released in 2004, Flint had taken on a smaller role in the band. During that period, Flint recorded a largely-forgotten solo album, Device #1, in 2003, and said he suffered from depression, forming a dependence on prescription drugs. "I'd line up rows of pills and just take them and take them and I'd lose track of how many until I passed out," he told The Times in 2009. Before marrying DJ Mayumi Kai, he gave up drugs, cigarettes and alcohol in 2006. By The Prodigy's latest releases, The Day Is My Enemy and No Tourists, Flint had assumed a central songwriting role. Ed Simons of British electronic music duo The Chemical Brothers paid tribute to Flint on Twitter, calling him a "great man." Electronic group Chase & Status added, "We wouldn't be here if it wasn't for Keith and the life changing music they made and championed."